Additional information on Tunisia on energypedia. Tunisia is a small country located in Northern Africa sharing borders with Algeria and Libya. The country entails the Northern reaches of the Sahara desert and the Eastern end of the Atlas Mountains and has a Mediterranean coast. Therefore, the country has a bright diversity on climate and biosphere. 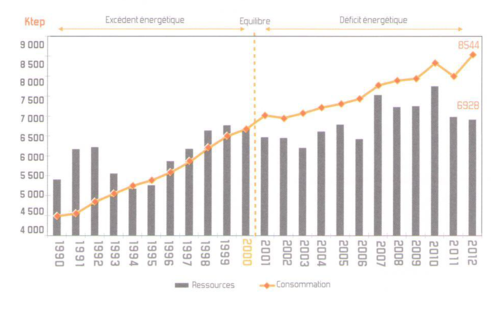 Since 1990, the Tunisian primary energy consumption has increased in a roughly linear way, with approximately 4,500 ktoe in 1990, 6,700 ktoe in 2000 and 8,300 ktoe in 2010 (without biomass). As shown in Figure 1, the sharpest increase is to be noticed in the gas sector, which represented 55 % of the primary energy supply in 2012. As a result, the share of oil, including crude oil and petroleum products, has slightly decreased. The share of coal and peat has always been minimal and now reached zero. The amount of biofuel and waste slightly increased (58 PJ in 2011), and currently represents 15 % of the primary energy supply. In 2014, primary energy consumption was about 9,200 ktoe (i.e. 107,000 GWh or 385 PJ), without biomass. 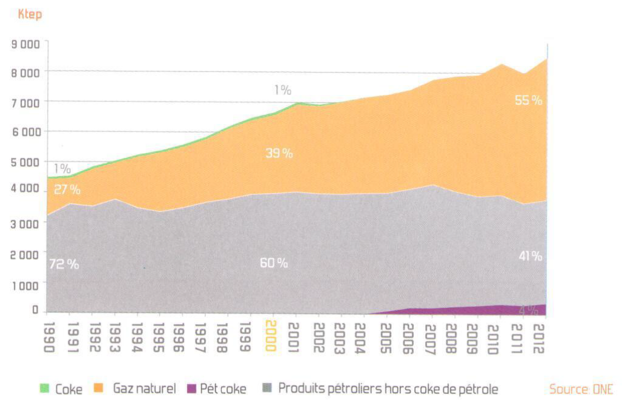 As shown in Figure 2, the Tunisian energy situation has drastically changed in the last two decades. Resulting from the economic development, primary energy demand has risen in a significantly steeper way than production. Consumption nearly doubled within 20 years between 1992 and 2012 from 4,500 ktoe to 8,500 ktoe. Between 1990 and 2000, consumption increased at a rate of 6.2%/year. Between 2000 and 2005, demand grew by 4.6%/year and between 2005 and 2009, annual demand growth slowed to 3.7%, mainly due to energy efficiency measures. In 2014, primary energy consumption was 9,200 ktoe (without biomass), of which 46% was provided by oil products, 53% was provided by natural gas and 1% by renewable energies. Oil production decreased between 1980 and 2012 from 120,000 to 67,000 barrels per day. Gas production, however, increased from 20 billion cubic feet in the early 1980s to 68 billion cubic feet in 2012. An overall increase in domestic primary energy production from 5,400 ktoe in 1900 to 7,000 ktoe in 2012 could not follow the sharp rise in demand. Hence the unbalanced consumption illustrated in Figure 2. Tunisia, a net energy exporter until 2000, has become a net importer. In 2014, 49% of natural gas consumption (2,300 ktoe) was covered by domestic production. The remaining 51% (2,400 ktoe) was imported from Algeria. Becoming a net importer implies a rise in energy prices since the mid-2000s (natural gas is today 8 times more expensive than it was in 2000) and a weak national currency (Dinar, TND) (2010: 1.8 TND=1.0 €; 2012: 2.0 TND=1.0 €; 2015:2.2 TND=1.0 €) makes the imports more expensive. Thus, expenses for energy represented 13.7% of GDP in 2012 − with expenses on energy import representing 16.8% of the global imports. The energy sector is heavily subsidised in Tunisia. Subsidies for natural gas as well as electricity started a sharp increase in the early 2000s. In 2012, energy subsidies amounted to 5,600 million TND (3,100 million EUR), i.e. 20% of public budget or 9% of GDP. Whereas energy subsidies only represented 3% of GDP in 2005. This rise in subsidies is not sustainable for the state and has several negative effects on public spending such as a decreasing budget for public investments. Subsidising procedures remain non-transparent. The subsidy system is composed of indirect and direct subsidies. Indirect subsidies are the difference between supply costs of crude oil and gas for the State, and the selling prices to the two public operators STIR for oil and STEG for natural gas. Direct subsidies are subsidies made ​​directly by the State to STIR and STEG in order to offset their deficits. As for electricity, average retail prices (0.14 TND/kWh in 2012) are significantly lower than average production costs for the State (0.26 TND/kWh in 2012). The discrepancies between average production cost and average retail price are even larger for natural gas. Currently, renewable energy plays a minor role in the energy supply.The use of solar energy for thermal purposes is widespread in Tunisia and can be regarded as a success story. Since its launch in 2005, the ANME program “PROSOL THERMIQUE”, meant to promote the installation of solar water heaters, has led to an installed capacity of 487,853 m2 in 2012. Regarding grid-connected renewables, the total installed capacity of renewable energy was an estimated of 312 MW in early 2016 (245 MW of wind energy, 62 MW of hydropower and 25 MW of PV), that was 6% of the total capacity. In terms of electricity production this meant 3% of this an annual production in 2013: 2.6% (357.8 GWh) from wind turbines and 0.4% (60.1 GWh) from hydropower. There are two large wind parks in Tunisia, both operated by state utility STEG, one in the region of Bizerte in Metline and Kechabta with a capacity of 190 MW operational since 2012; and one in the region of Sidi Daoud, with a capacity of 55 MW, built in 3 phases between 2000 and 2009. As for photovoltaics, there was a total capacity of 25 MW as of early 2016, mostly small-scale private installations most of whose capacity ranges between 1 kW and 10 kW. In low voltage, in the residential sector the capacities range from 1 kW to 17 kW and in the commercial sector capacities are between 10 and 30 kW. In medium voltage, capacities in commercial sector range between 25 and 100 kW. As of early 2015, there were only three operational PV installations with a capacity of at least 100 kW: a 149 kWp installation in Sfax, a 211 kWp installation operated by the Tunisian potable water supply company SONEDE and a 100 kWp installation in the region of Korba, both connected to the medium voltage, and realized by Tunisian installer companies. The first large scale solar power plant of a 10 MW capacity, co-financed by the German development bank KfW and the EU's Neighbourhood Investment Facility (NIF) and implemented by STEG, is due 2018 in Tozeur. Regarding the off-grid use of renewable energies, 11,000 decentralised PV systems have been installed. The installed capacity was of 4,799 MW in 2014 ‒ with the biggest share (4,492 MW/94%) provided by natural gas fired thermal power stations. The 6% left are divided between hydroelectric power (62 MW as of 2014) and wind generating plants (245 MW as of 2014). Electricity is generated almost exclusively from combustible fossil fuels: 93 % natural gas, 7 % heavy fuel with only a tiny share left to renewables (3% in 2013). In 2014, the state-owned company, STEG, remained the major electricity producer, supplying 86% of the demand, followed by an IPP, CPC (Carthage Power Company) which produced 10% of the consumed electricity. The last 4% are produced by small scale producers for their own needs (e.g. industries). The peak load in 2012 was 3 353 MW and in 2013, due to more favorable climatic conditions, 3 144 MW. In Tunisia 46% of the electricity was consumed on the low voltage level, 45% on the medium voltage and 9% on the high voltage level. 1Total may not add up due to rounding. The gas consumption has marked a steep increase (5,344 Ktep in 2013) and 72.5% of its production is used for electricity consumption, 7.1% for the industry sector and 20% for the residential and tertiary sectors. STEG controls the Tunisian grid and holds a monopoly on electricity transportation and distribution. The grid has three voltages: high (225 kV), medium (150 kV) and low (90 kV). 99.5% of the households have had an access to electricity since 2006. The transmission grid is connected to the Algerian grid and, on its Eastern end, to Libya. Regional grid synchronisation tests with the participation of Morocco, Algeria, Tunisia, Libya and Egypt have been carried out but failed so far due to frequent synchronization issues with the Egyptian grid. Furthermore, a 400 kV high voltage sea cable with a capacity of 1,000 MW binding North Africa to Europe via Tunisia and Italy is currently discussed. Grid losses are primarily due to maintenance or other incidents. Along with the prolonging of the transmission grid, losses have risen: in 2012 it represented 2,735 GWh. The growing economy of Tunisia and rise of living standards contributed to a significant increase in the electricity consumption leading to ever more often grid saturation. In addition, some power plants and facilities are out-dated and can no longer cope with the actual load of the network; hence, overload, losses and high voltage drops occur on a regular basis. To address these issues, the »Electricity Distribution Network Rehabilitation and Restructuring Project« has been launched, this should improve the reliability and safety of electricity distribution. The Tunisian electricity tariff system is complex, subsidized and cross-subsidized. On the general low voltage, tariffs depend on the sector of the consumer (residential or non-residential) and the consumption per month in kWh. Tariffs are most heavily subsidized for households whose monthly consumption is below 50, 100 and 200 kWh. These households pay 0.075 TND [0.034 EUR], 0.108 TND [0.049 EUR] and 0.140 TND [0.064 EUR] for each kWh consumed. Households whose consumption surpasses 200 kWh per month have to pay 0.151 TND (0.069 €)/kWh for the first 200 kWh, 0.184 TND (0.084 €)/kWh for the following 100 kWh, 0.280 TND (0.13 €)/kWh for the following 200 kWh, and 0.350 TND (0.16 €) for each kWh above 500 kWh/month. Production costs are thus more than covered in the tranches 301-500. There are three to four tariff slots depending on the sector and on the day time. Prices range from 0.088 TND/kWh (0.040 €) to 0.238 TND/kWh (0.109 €). The subsidies no longer apply to cement producers which have paid electricity to its real cost since 2014 (cheapest slot: 0.129 TND (0.059 €)/kWh, most expensive slot 0.311 TND (0.142€)/kWh). This represents a tiny share of the market, with only a handsome of subscribers. There are four tariff slots and prices range between 0.111 TND (0.051€)/kWh and 0.233 TND (0.106€)/kWh). Exploration and exploitation of conventional and unconventional fossil resources are carried outin order to address the demand and limit importations. Generally speaking, diversity should help protecting Tunisia from the international prices volatility and reduce its import dependency. In order to reduce its dependency from Algerian gas, Tunisia needs to diversify its electric mix and extend its interconnections. A gas interconnection with Italy already exists (“Gazoduc”), currently being used to transport Algerian gas to Europe. However this interconnection may be used for imports in future. An electric interconnection with Italy with a 400 kV submarine cable is currently being considered. It may be used for import and export later on: complementary daily and annual production and consumption profiles of North Africa and Europe can create synergies. Furthermore, there is a strong need for institutional and budget reforms in the energy sector since the current situation drastically differs from the one 20 years ago. Some of its aspects such as subsidies have become a burden hindering a further development of the whole sector. In November 2014, the Industry Minister M. Ben Naceur called for drastic cuts for the year 2015. Subsidies should decrease from 1.3 billion Euros (2.7 billion TND) to 0.9 billion Euros (1.96 billion TND) in order to use the saved money in investment projects. In 2014, energy prices were raised by approximately 10% in total in order to reduce subsidies. By June 2014, electricity price subsidies for cement producers’ were completely phased out. Forecasts from the ANME expected the consumption to double by 2030 without implementation of a comprehensive action, therefore energy efficiency should be further strengthened. Measures since 2000 have brought results: Tunisia has reduced its energy intensity by 20%. A new law on renewable energies was adopted by Parliament in May 2015. The objective of this law is to promote private investment in renewables to contribute to the 30/30 objective of the Tunisian Solar Plan. The law foresees three project development regimes: (1) self-consumption, (2a) complete sale of electricity to the utility STEG (feed-in tarifs, projects under 10 MW for PV and 30 MW for wind), (2b) complete sale of electricity to the utility STEG (tenders, projects above 10 MW for PV and 30 MW for wind), (3) electricity export. The implementation bylaws of the RE law were approved by the Council of Ministers in July 2016. As of August 2016, the new regulatory framework is not yet being implemented. The Tunisian Solar Plan, a renewable energy development plan elaborated by the ANME but not officially adopted by parliament or government, foresees a 30% share of renewables in the electricity mix by 2030. This corresponds to an additional totally capacity of 3 GW and an overall investment of 4.75 billion euro. Figure 3 shows the development goals by technology.The Tunisian Solar Plan was updated in 2014, and a new update is planned for 2015. The law No. 2004-72 on the rational use of energy defines wise use of energy as a national priority and as the most important element of a sustainable development policy. It states three principal goals: energy saving, renewable energy promotion and creation of new forms of energy, that favour costs’ reduction as well as the National economy and the environment. The National Energy Conservation Action Plan consists of three phases: (1) awareness raising, first concrete and grass-root actions were taken under two programs, (2000-2013) that contributed to an annual decrease of 2% in energy intensity; (2) continued implementation and voluntary investment via the mobilisation of industry, construction and transport (audits, cogeneration, lighting, household appliances, buildings, transport); (3) implementation of large scale projects in order to reach the 30-30 goals ‒ 30% of electricity shall be produced by renewable sources by 2030 ‒ (2020-2030). The Action Plan also foresees an independent regulator in the electricity market. DGE (Direction Générale de l’Energie, Directorate-General for Energy) is a sub-department of the Ministry of Industry, Energy and Mines. It is designed to conceive, coordinate and implement the national energy policy and to draft energy action plans and energy management programs. STEG (Société Tunisienne de l’Electricité et du Gaz, Tunisian Company for Electricity and Gas) is the national energy producer, TSO and supplier. The STEG was created by law 62-8 in 1962. ETAP (Entreprise Tunisienne des Activités Pétrolières, Tunisian Refining Industry Company). Created in 1972, this stated-owned company plans oil and gas explorations and manage national gas and petroleum wealth. ANME (Agence Nationale de la Maîtrise de l’Energie, National Agency for Energy Management). Created in 1985, this agency specialised in energy management supports the Industry Ministry on energy transition. AGIL (Société Nationale de Distribution des Pétroles, National Company of Oil Distribution) shares the oil distribution market with some private companies (s.a. Total, Shell, BP, etc.). STEG Energies Renouvelables, created in 2010, this is a branch of the Tunisian Company for Electricity and Gas fully devoted to renewable energies. STEG is the national utility, it holds a monopoly. Carthage Power Company (CPC): Radès II Power Station (natural gas fired plant, total capacity 480 MW) started operation in 2002 under the terms of a build own operate (BOO) agreement and by 2010 was responsible for 21% of national production. Societe d’Electricite d’El Bibane (SEEB): Tunisia’s second IPP, two 13.5 MW gas turbines that went on line in 2003. ↑ 1.0 1.1 Bureau des statistiques, Ministère de l’Industrie. ↑ ANME Maîtrise de l'Energie en Tunisie - Chiffres Clés, p19. ↑ 3.0 3.1 3.2 3.3 Bureau des statistiques, Ministère de l‘Industrie. ↑ 6.0 6.1 6.2 6.3 Ibid. 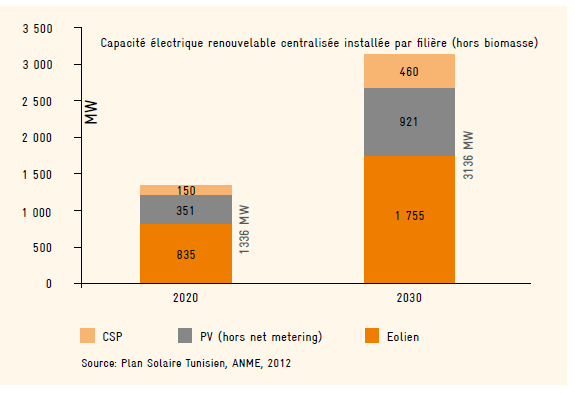 ↑ ANME, Maîtrise de l'Energie en Tunisie - Chiffres Clés, p18. ↑ Présentation Déjeuner-Débat du 24 Mars 2014, Rafik Missaoui. ↑ GIZ, Le marché solaire thermique en Tunisie. Christopher Gross, Situation actuelle et perspectives (2013). ↑ 13.0 13.1 GIZ, Enabling PV. ↑ GIZ, Secretariat of the German-Tunisian Energy Partnership. ↑ STEG, Rapport annuel 2013. ↑ ANME, Stratégie Nationale de maîtrise de l‘énergie. Objectifs, moyens et enjeux. This page was last modified on 10 July 2018, at 22:08. This page has been accessed 199,918 times.